The Man Cave is Now Bright and Inviting! A 7 Week Journey. Many thanks to those that supported me during the ORC: George (my new friend), Theresa who cheered me on and painted with me, and my Mom who help validate ideas and finishing touches. Without George and his physical help I couldn’t have done this! 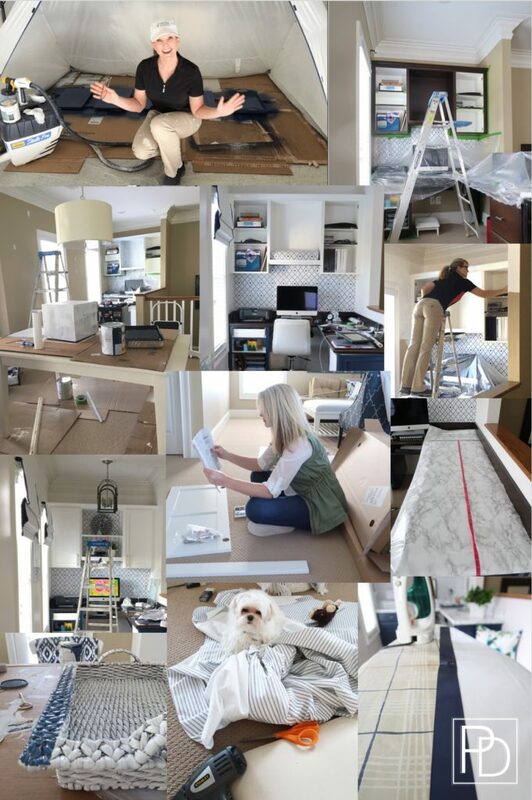 More than just a makeover occurred during this One Room Challenge™. It was a personal journey. 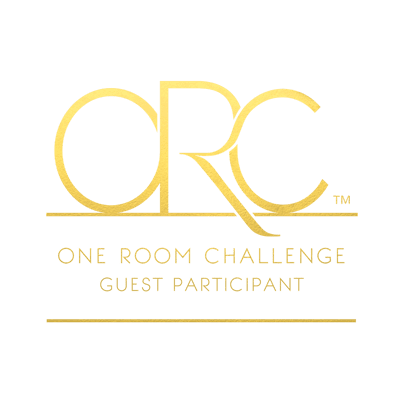 Please support the fantastic sponsors who supplied products for my One Room Challenge: Warner Spray Tech, Progress Lighting, and Amerock Cabinet Hardware. Hurray! I am SO happy to be sharing with you the final results of my massive man cave makeover this week! Can you believe it? I sure can’t, but now understand why I am bruised, my carpal tunnel is in full swing, and I ache all over. This was a LOT for anyone to tackle, but darn-it when I set a goal I am determined to complete it! To appreciate the “after”, I need to remind you of the before and why I decided to overhaul the space in the first place. It was dark, uninviting, and uninspiring. Apparently perfect for teenage boys LOL! It was time to make it my space and a grown up entertaining space for my college aged son. Are you ready to see it now? It’s been hard for me to fully appreciate the change because it happened in little increments every day. It all started with the light fixture! I loved the lines, then found the wall paper, and hardware to reflect the shapes in the fixture. Ah then the plate! That gorgeous plate came from a trip to Italy and was in a drawer. It is so nice to be able to display it again in my home. Bad paint forced white walls and I think they make the BIGGEST difference. I saw white walls in my mind, but my body was saying “no more painting”. That bad can of paint forced my hand because I couldn’t touch up where I’d removed the drapery rods and spackled. Adding a Morroccan Star white and navy peel and stick wallpaper to the back wall now opens up the space and makes it look larger. 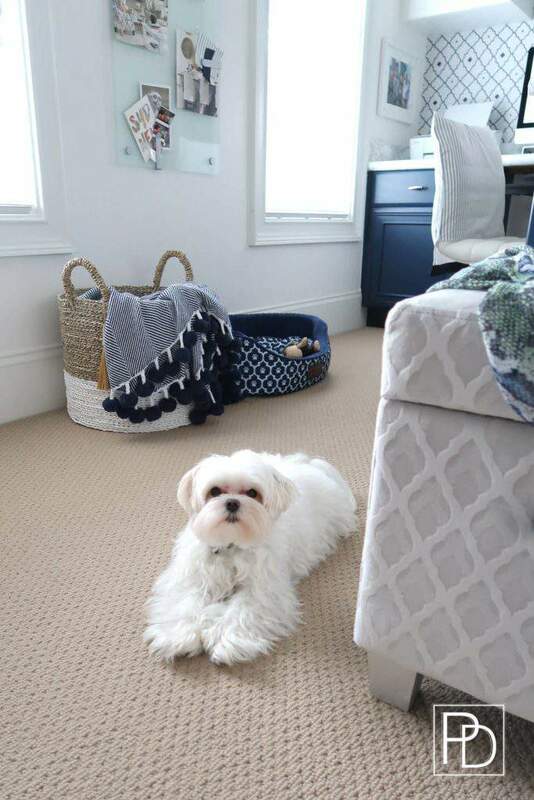 Mick has a new coordinating dog bed and hops up on his hind legs in the mornings when I ask “Are you ready to go to work upstairs?” He loves to be up here now as much as I do! Plus where there used to be a noisy and ugly refrigerator there is now a bench for Mick and me to sit on and look out the window. Sometimes you just want to get away from the monitors and office chair! Of course I spray painted the feet silver to give it an upgrade too. 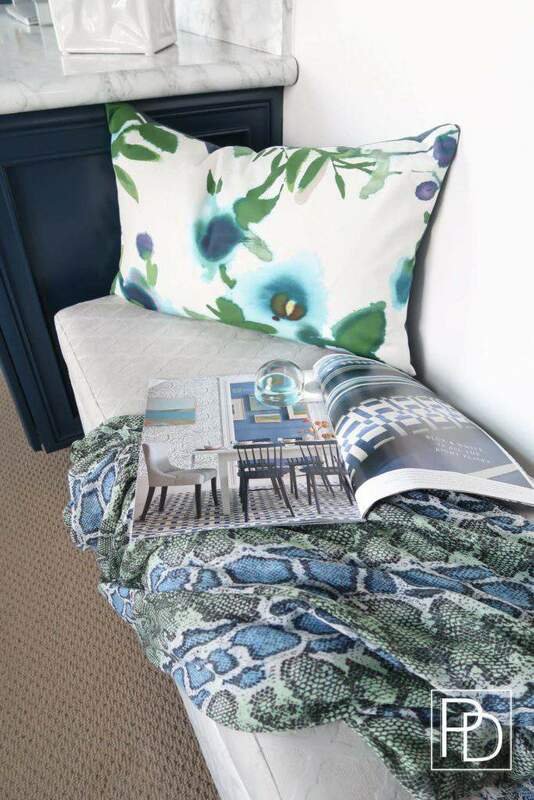 The Thibaut watercolor floral pillow was the PERFECT find to tie the whole room together. That scarf I took off one day and threw it on the bench and thought it looked great! The office chair slipcover was a NO SEW project that only took 30 minutes with a little pinning and hemming tape. It’s SO CUTE and makes a basic chair look custom. 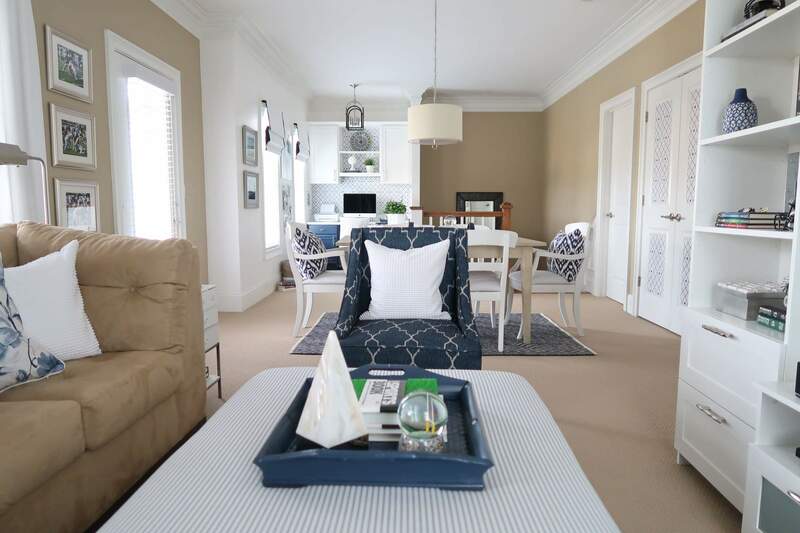 The polished nickel hardware reflects the light and the shapes in the Moroccan wallpaper too! 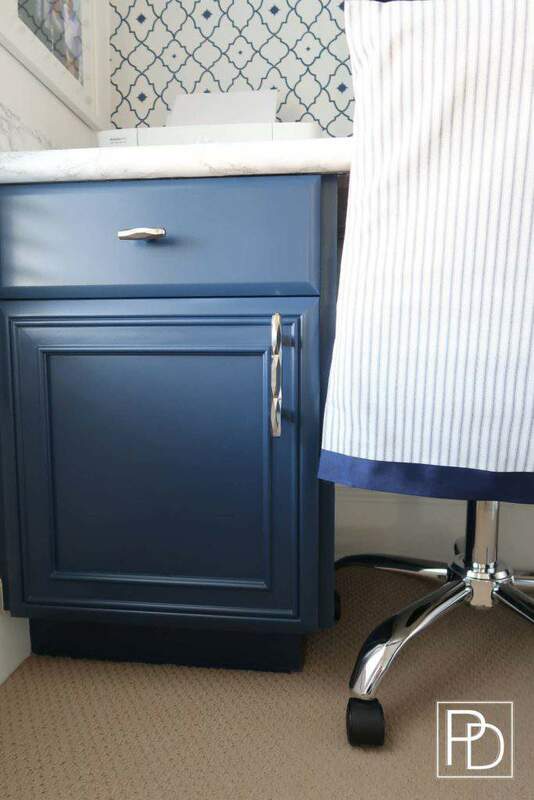 The finish complements the white and navy cabinets. The white board/inspiration board was a fun find during a trip to IKEA! It’s tempered glass like the cool artwork and great find at Home Goods. I’ll use this board with a dry erase marker too for my many to-do lists. Marble contact paper to me was a huge upgrade to the dark brown veneered counters and was only $50 plus my free labor! Now in the evenings I can actually see the desk. The new light fixture is so much brighter and more effective than a can light and lights up all of the counter space. Affiliate links included, but all items were hand selected by me! This is where a LOT of labor and painting happened and I attempted a driftwood faux paint finish on the table. Remember the chairs and table used to be black and the chair covers dark blue and red? Is anyone interested in a tutorial on the faux finish to create a Driftwood finish? I thought it came out really well considering I made up the technique! Here’s a close up of the driftwood finish for you. 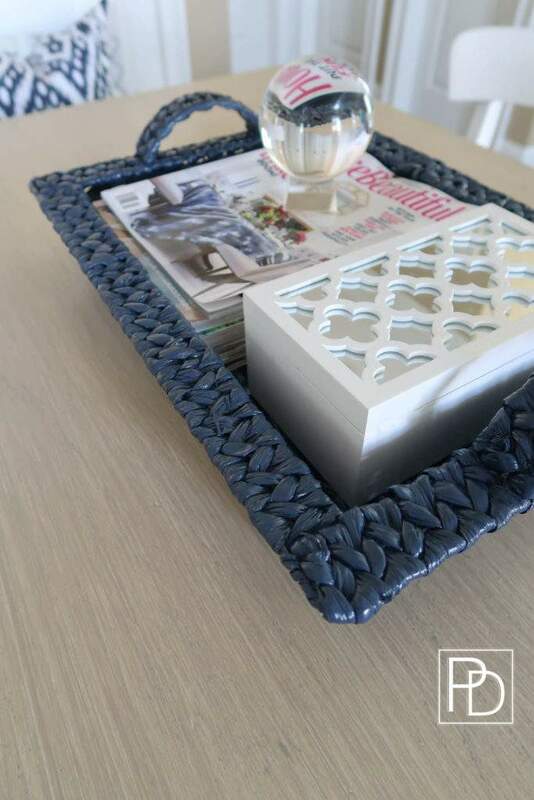 Using trays is an inexpensive way to give a table or space personality. Within this space are 3! One on the office counter, the table and coffee table. Two were in the donation pile and the other was on top the mini refrigerator. With a little navy paint, they all got a new life! Do you have pictures on your iPhone and can’t enjoy them regularly? One of my favorite additions to the sitting area and room in general are framed photos. 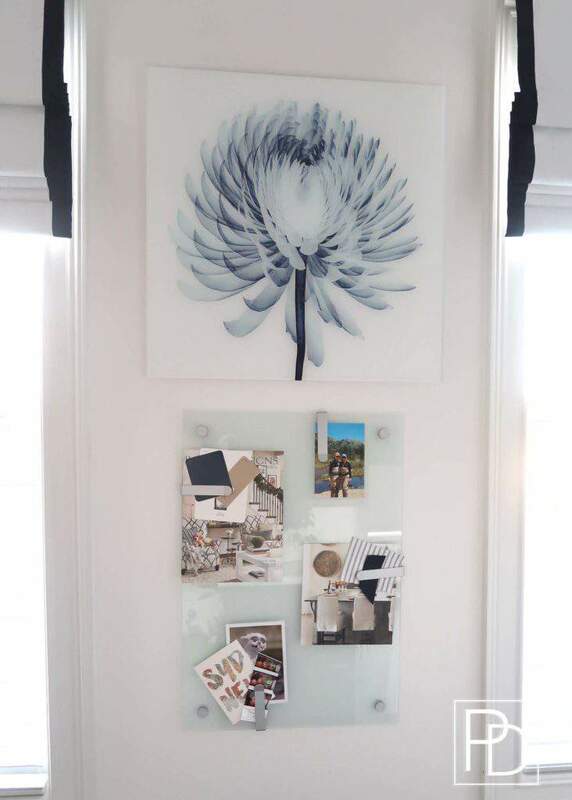 They are an inexpensive way to add art to the walls and also a great way to enjoy trips and special events. The three photos on the left are a triptograph of my son’s first tackle in college football! The two photos in the silver frames are from a coastal walk in Sydney, Australia with my son. Every year or so they can be easily updated with new memories! Now the table is a space that I can enjoy, spread out to work, and the family can play games here too when they are visiting. 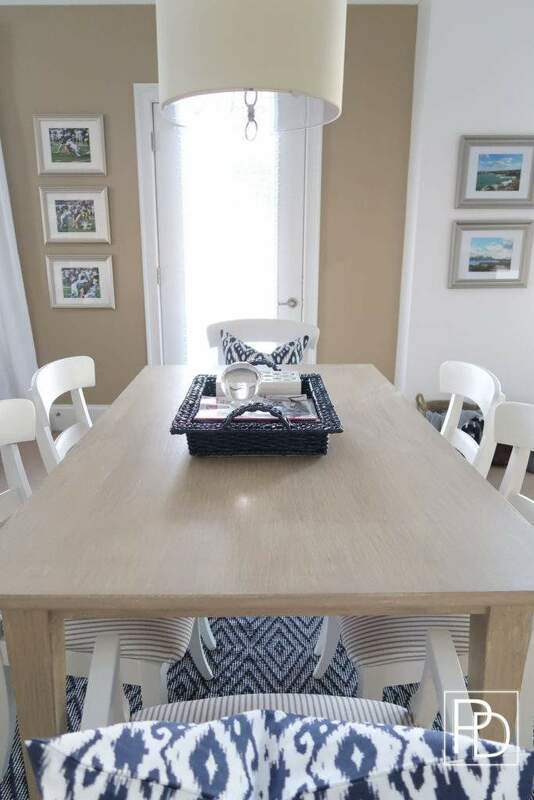 I don’t have a kitchen table only an island, so this extra sitting area is a great addition to the home. The view from here is spectacular. This is where my SON comes in and football was the major theme of the room. Believe it or not most of the accessories in the room were already there and I just moved things around to make it look better! 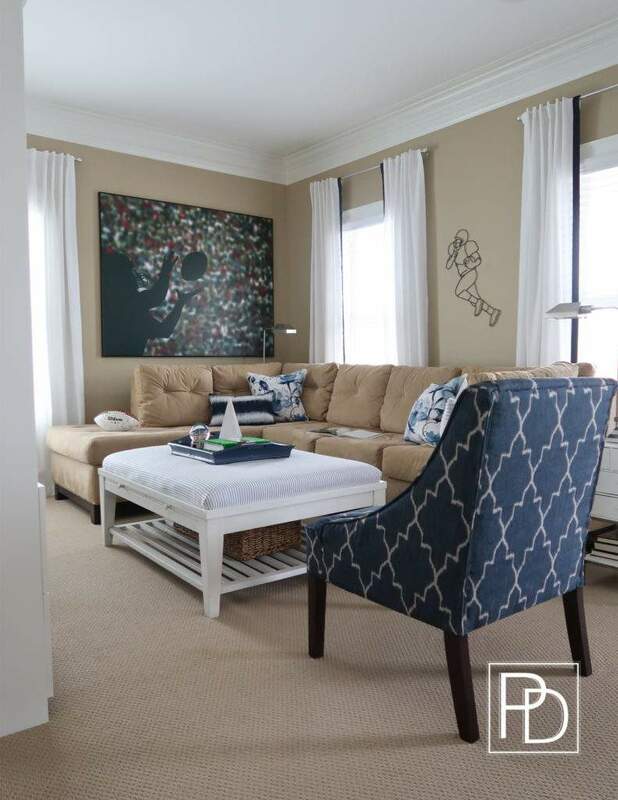 Adding navy trim to the plain white drapes gave them a more sophisticated and custom look for very little money. It was a very inexpensive and easy NO SEW project that creates big impact! Don’t you think the new navy chair is a HUGE improvement over the gaming chair LOL! The price was amazing and with free shipping from Amazon I had to buy it! The new pharmacy lamps fit the narrow space and the satin nickel finish complements other home decor in the man cave. 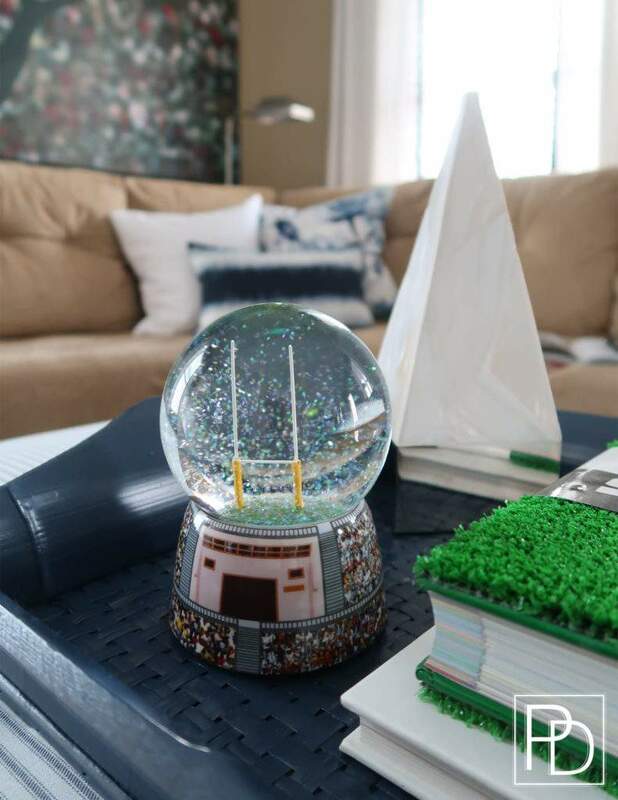 This football snow globe was the best find during my son’s and my annual pre-Christmas trip to the mountains in Blowing Rock, NC. We found this in a gift shop and had to buy it! Now it has a prominent position in the room to bring back a memory of a fun day together. The Sports Book with a turf cover was hiding in the office bookcase and now adds a great pop of green in the middle of the room to evoke the football game day feel. When it comes to a man cave, the entertainment wall is the key to a great room. The original media furniture was too big for the space and needed to be replaced. The white against the tan walls pops and the new layout provided space to hang some key footballs from our favorite teams plus display childhood trophies. My favorite update to this space was framing a T-Shirt from his first college homecoming game, so we can remember it for years to come! Replacing the original IKEA hardware with the same hardware as found in the office creates a much higher end look to very affordable furniture. 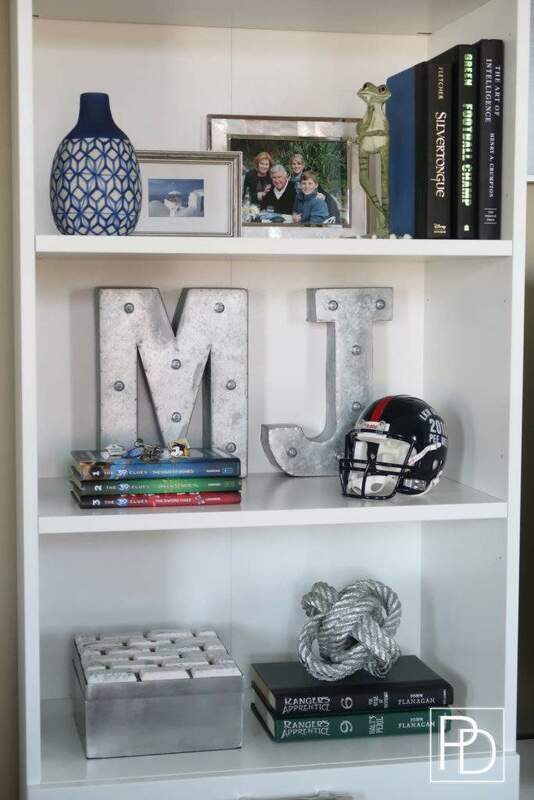 He’s always been a voracious reader and I wanted to remind him of that by displaying some of his favorite book series! While organizing, I found all of these little pins he used to have on his back pack in elementary school. They are so cute and many came from jobs that I had or from business trips. He loved having them to look at, when we weren’t together. Now you see that it’s possible to have a man cave in light and bright colors versus the dark rich tones typically used. It’s now a family space that is multi-use and one I LOVE to be in everyday. I didn’t completely take the man out, but instead put the woman into the man cave! This went from his space to our space and I can’t wait to debut it to my family next week during the Thanksgiving holiday. I see a fun game night bubbling up at that newly painted game table. That’s all she wrote, folks! 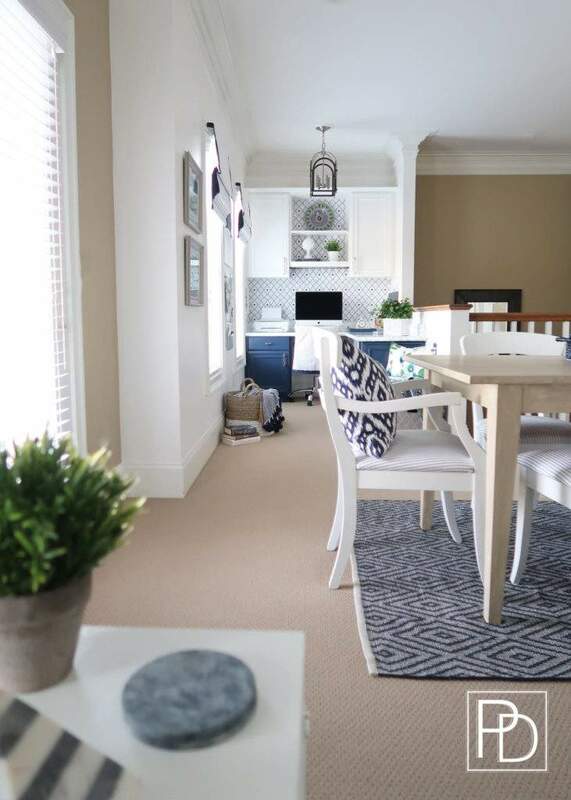 Have fun enjoying the other reveals from the guest participants at The One Room Challenge Reveal Week and see final projects of the 20 Featured Designers. Thanks to the sponsor Calling It Home and media sponsor House Beautiful for hosting this fun event. 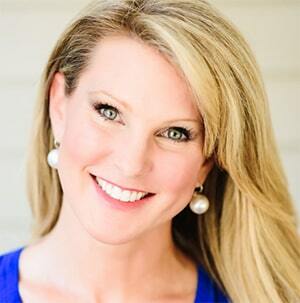 I am looking forward to seeing my fellow design blogger friend’s reveals: Kelley Nan and Driven by Decor! Beautiful Job Tracy! I love all the colors , you created an amazing space..you must be very happy with the transformation. Denise, Thank you! I love the space and excited to share it with my son over Christmas. It’s a great place to work and relax – sunny and happy! Wow! Just so very proud of you -seeing the before and during in person makes me so happy to see this BIG reveal – I know all the tremendous thought, labor, sweat, re-do’s, learnings……you did it all with a smile and never let anything detour you- just like you do in life – love you!!! Love you! Thanks for your encouragement and mad edging skills 🙂 Glad you got to see the “during” and stayed here any way! Thanks, Delia! I appreciate your kind words. It means so much that you stopped by my reveal and took the time to comment! Your words mean so much. You have been a great inspiration to me (plus super helpful) and I am one of your biggest fans! Your office makeover inspired mine. Now we both have pretty places to work ? 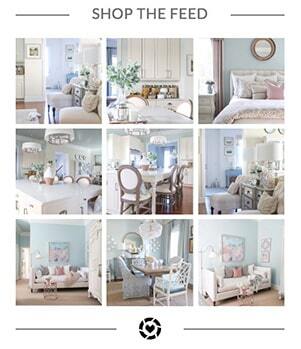 Love your bedroom reveal and glad that chandelier got straightened out. It is gorgeous! What an amazing transformation! I love how creative you are and the love and work you poured into this makeover was all worth it because the result is amazing. Congratulations! Hi, Linda! So nice you stopped by to see the reveal. Thanks so much for your kind words and it’s nice you see how creative I had to be on a budget 🙂 Hope you are well and we bump into each other soon! OMG, can’t believe it’s the same space?! Fantastic room! Everything is beautiful but I love the desk area the most! Cheers to us for another room done! Woo hoo! It feels good to be done for sure! Thank you it’s a huge transformation 😉 I’m sitting at the desk now and agree! Tracey, I love what you did with the man cave. So creative in the style choices and your own two hands. I know it was hard work but it all paid off. 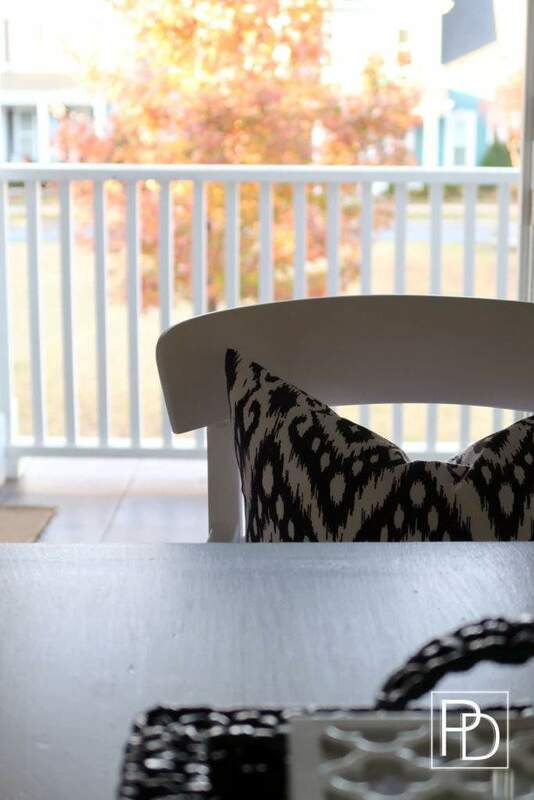 I’m sure your family will love spending Thanksgiving enjoying the new bright space. Hey, Carol! Thanks SO much I really appreciate it 🙂 Happy Thanksgiving! Your space turned out beautifully! 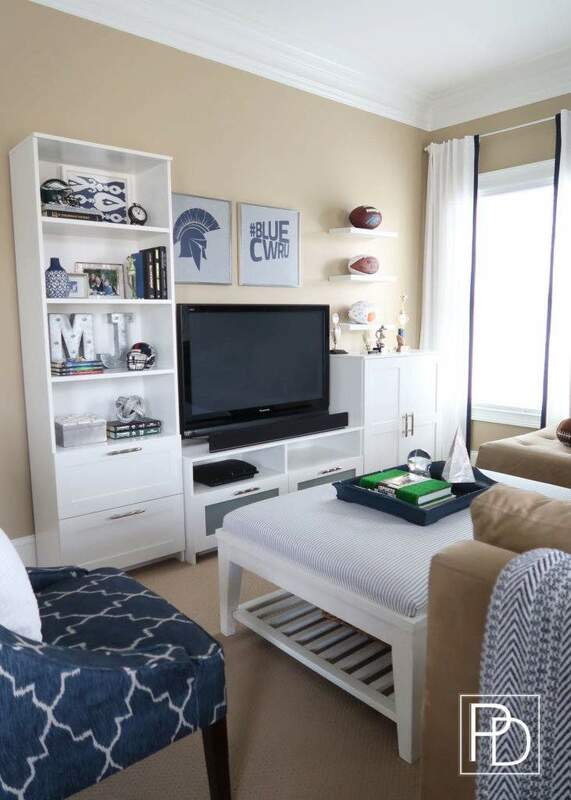 Love the classic blue and white and how it is no longer a man cave but still comfortable enough for you and your son to hang out in. Well done my friend! drooling over your rope wall with the navy cabinets. Just gorgeous and glad we’ve met face to face. Cheers to your success! Such a great transformation! The space is bright and airy. I love the idea of the faux marble. Faux marble is AMAZING! I’ve been living with it for a few weeks and absolutely love it how good it looks for vinyl contact paper. I’m going to use it again, in another space. This looks amazing. What a gorgeous transformation. 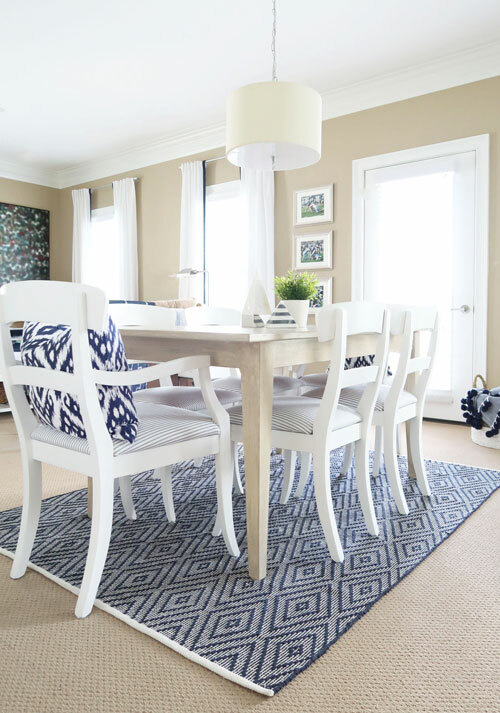 I love the lighter, brighter color scheme and how you were able to re-use and transform many of your original pieces. Many readers like me aren’t bloggers or professional decorators and don’t have sponsors or other “ins” to receive discounts or free product, so re-using and transforming is necessity for most of us. You did an awesome job. I look forward to more of your posts. Linda, thanks for saying that and I’m glad you appreciate my efforts to keep the budget as low as possible but create a huge impact. Re-using and re-purposing really is a great approach to re-decorating! What a stunning transformation! So much brighter and welcoming! I love all the touches of blue you added. Honored to have done this ORC with you! Love it all! The blue and white are so crisp together and the wall paper in the office! LOVE! Fabulous job! Wowza! Great job! Love seeing all that you’ve done. So glad you’re feeling happier. Love the design touches!! Such an amazing transformation! The space is now so light and bright! This has been such an inspiring round of the ORC. I really appreciated the extra week. Thank you! I’ve seen some amazing transformations and that extra week brought with it extra effort and gorgeous photography! Have a wonderful holiday season. I love the color scheme, beautiful work! Just gorgeous – your office space is perfection! Its absolutely beautiful Tracey! I love every detail! You are one amazing woman! Rachel, I appreciate that so much and glad you love it! Tracey this was worth the wait! You killed it! And I’m super impressed by all of the handywoman hats you wore! Congrats! Kris, thank you! 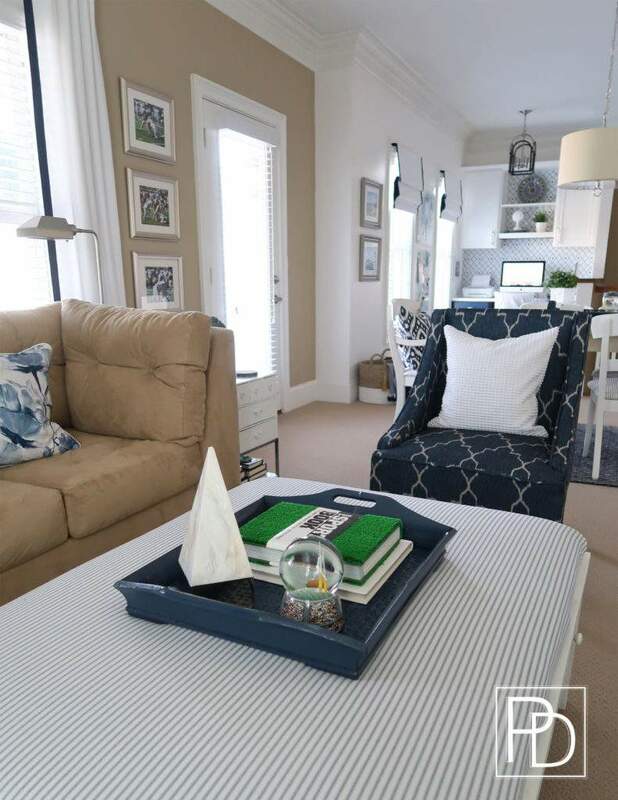 I definitely put my heart, BODY, and soul into this makeover 🙂 Your navy and white room is beautiful too! We could swap wallpapers and roman shades in our rooms. Great minds think alike! You created a beautiful space! Congratulations, and on the new job too! 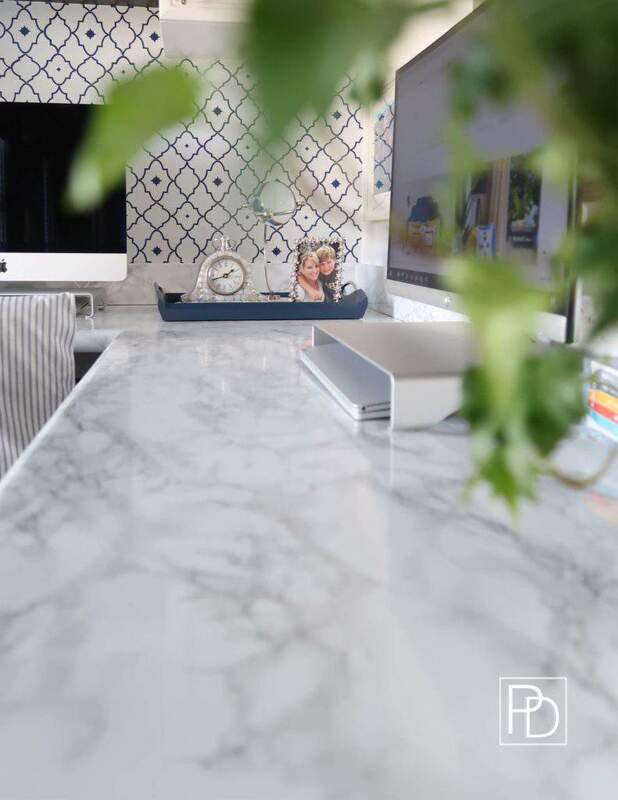 The faux marble is genius when you want to avoid a budget-buster. I hope your family enjoys this space!